In this chapter, we learned the progressive and past tense for both positive and negative verbs. We also learned the te-form for the progressive tense as well a number of other uses. Here is a list of examples using the various conjugations we learned in this chapter. We learned many conjugation rules in this chapter which you’ll need to practice until they are almost instinctive both for speaking and listening. I recommend using flash cards to practice conjugation rules using a mix of every type of verb, adjective, and nouns. Here are some suggestions and examples of how you might want to make your own cards. The important thing is to focus your cards on areas you are weak at and to make sure you are comfortable with conjugating any word in any tense at a moment’s notice. To get a good representation, you should use at least these common verbs, nouns, and adjectives. Conversation is often made up of narratives whether it’s about events happening around us or what people think and feel. In this chapter, we’ve learned many grammatical structures that allow us to talk about what’s happening and what people are thinking and saying. A good way to practice what you learned in this chapter is to talk or write about anything on your mind whether it’s something interesting that happened recently, somebody you’ve recently met, or what your plans are for the future. Below is a very small list of things you can write and talk about. Thing(s) oneself is thinking and feeling lately (among other things). Interesting thing(s) that happened recently. Reason why (you) thought (you) want to study Japanese. Thing(s) (you) want to do in the future. The conjugations we have learned so far for the negative and past tense are just one of several. In this section, we are going to look at an alternate way to conjugate to the negative for the polite form. For verbs, we learned the four conjugations for the polite 「～ます」 form as shown by the example below. For the two negative forms highlighted in the table, instead of using the 「～ます」 form, we can instead append 「です」 to the plain negative forms similar to nouns. For negative: Conjugate to the negative and append 「です」. For negative past: Conjugate to the negative past and append 「です」. Have you not been to Tokyo? (I) ate lunch already so (I’m) not hungry. Did (you) not see a black dog around here? Because 「ない」 is the negative of the verb 「ある」, we can replace the 「ないです」 and 「なかったです」 part of noun and adjectives with 「ありません」 and 「ありませんでした」 respectively. For nouns and na-adjectives: Append 「じゃ」 and then 「ありません」 for the negative or 「ありませんでした」 for the negative past. For i-adjectives: Replace the last 「い」 with 「く」 at the end and attach 「ありません」 for negative and 「ありませんでした」 for negative past. I don’t want to hear your excuse(s). That’s not a place to play, you know. (I) went to that restaurant last week but (it) wasn’t very tasty. Using 「です」 for the negative is primarily for spoken Japanese only and is used to soften the negative aspect in conversations. On the other hand, the 「～ません」 and 「～ませんでした」 conjugations sound a bit stiff and formal and is more suitable for written Japanese. It also sounds more assertive so it would appropriate for settings such a news report, an announcement, or any formal occasion. A transitive verb is one that requires an agent to complete the verb while an intransitive verb is complete in itself and doesn’t require a direct object. In Japanese, it is important to distinguish between these two types of verbs because intransitive verbs cannot take a direct object (the 「を」 particle). Below is a sample list of common transitive and intransitive verbs and examples of how the particles change depending on which type of verb is used. Start conversation with a person (you) don’t know. Tanaka: It isn’t that Suzuki-san (you) dropped it? Suzuki: No, I didn’t do anything, you know. Tanaka: Then, is it that this cup fell by itself? Suzuki: It was already fallen before I came here so (I) don’t know. Tanaka: No, (I) saw Suzuki-san (you) dropping that cup, you know. “Have you ever done [X]?”, you can ask a question of this nature quite literally by using the noun for a generic event: 「こと」（事） and 「ある」. (I) had never eaten okonomiyaki but (I) finally ate (it) when (I) went to Japan. Thank you for the email. I wrote that I wanted to practice English but I don’t have much self-confidence yet so I will write the reply in Japanese. I live in a place called Kawaguchi-shi north of Tokyo. Have you ever gone to Tokyo? There are a lot of people and it’s a very busy place. And then, there are lots of tasty restaurants. Have you ever eaten things like Okonomiyaki and Monjayaki? Monjayaki is famous in Tokyo. As for Smith-san, are you living in America? As for me, I have not yet been to America but I’m thinking I want to go sight-seeing to places like New York and LA. That’s why I’m studying English but it’s pretty difficult and there’s still a lot of things I don’t understand. Let’s work hard together and study! The most straight-forward reason to phrase a verb clause is to quote somebody. 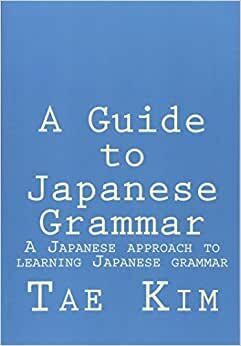 A verb clause can be phrased by adding 「と」 to the end of the clause. For verb clauses that end in an plain noun or na-adjective, we must add 「だ」. A direct quote would use the Japanese version of double-quotes: 「」 but you can also paraphrase. Smith-san said “he/she is not coming today”. He always says (he/she) is busy. She said (he/she) is free next week. This grammar is also very useful for defining things and asking how one would say something. Smith: Brown-san, where is the bathroom? Brown: Of course, it’s in the bathroom. Yamamoto: Brown-san, in Japanese, toilet has the same meaning as bathroom. Brown: Then, what do you say in Japanese for “toilet”? Yamamoto: (You) also say 「トイレ」 for “toilet”. Brown: How do (you) understand the difference? Yamamoto: In most cases, (you) understand by context. Brown: For example, how would (you) say “sit on the bathroom” in Japanese? Smith: Normally, (you) don’t say such a stupid thing. There are many other verbs that can be used with a phrased verb clause as you can see in the following examples. Do (you) think the college cafeteria is tasty? (I) heard that this train is (the) fastest to school but (it’s) not fast at all. (I) sent by mail that I’m going to be late tomorrow! Promised not to smoke cigarettes. Decided to go do study abroad to Japan next year. In addition, this grammar also gives us another way to do introductions. Nice to meet you. I’m Alice Smith. It was written in the forum that you are looking for a partner to practice English so I’m sending you this email. I’m currently studying Japanese at an American university and thinking that I want to practice Japanese a lot. How about studying together? The phrase 「という」 is used so often and in so many ways that there is a shortened casual version: 「って」. John: Alice-chan is late, huh? Lee: (She’s) busy with study so (she) said (she’s) not coming today. John: What are (you) going to do, studying all the time? Despite the fact that (It’s) said that you’ll get a lot more studying by practicing Japanese while playing with everybody. Lee: I guess so. But, I think it’s good to use textbook and study properly once in a while. John: By saying that, you want to say (I) don’t study at all? In the second chapter, we learned how to list multiple nouns using 「と」、「や」、and 「とか」. Using the te-form, we now know how to list multiple verb clauses similar to 「と」. However, in order to create a partial list of verbs similar to 「や」 and 「とか」, we must use another construction described below. Conjugate all the verbs to the past tense and attach 「り」 to each verb. Finally, add 「する」 at the end. Do things like eating and drinking. Like to do things like sleeping and reading book(s). (I) did things like drink beer and watch tv. Do (you) do things like sports and strolls? There may be more than one reason for something but 「から」 and 「ので」 can only connect two sentences. Once again, we can use the te-form to list multiple reasons in one sentence. However, if we want to imply that the list is only several among a larger list of potential reasons, we can add 「し」 to the end of each verb clause. Note: You must add 「だ」 for plain nouns and na-adjectives. Because she is pretty, gentle, and smart, (she’s) popular with everybody. Because she is pretty, gentle, and smart (among other reasons), (she’s) popular with everybody. Because today is hot (among other reasons) and there’s also no class so let’s go to the pool. (I’m) tired and sleepy (among other reasons), (I) don’t want to go anywhere today. Alice: What were you doing yesterday? John: There was no homework and (I) was free (among other reasons) so (I) watched TV and listened to music (among other things). What about (you) Alice-chan. Alice: There was homework. (I) was doing that, you know. Alice: What are you going to do? John: (It’s) ok. (I’ll) do it while listening to class. Alice: Same as always, huh? In this section, we’ll learn how to describe verbs that happen after, before, and at the same time as another verb. To describe clauses that happen sequentially, we must first learn all the te-form conjugation rules. For the progressive tense, we only needed to learn the conjugation rules for plain verbs. However, nouns, adjectives, and the negative form can also be conjugated to the te-form. Plain nouns and na-adjectives: Attach 「で」 to the noun or na-adjective. I-adjectives and negative: Replace the last 「い」 with 「くて」. The te-form we learned at the beginning of this chapter is very versatile and has many uses. In fact, the te-form alone is used to express a sequence of actions that happen one after another. This will make your conversations smoother as it allows you to connect multiple sentences instead of having many smaller, separate sentences that are often too short. Morning, (I) woke up. Then (I) ate breakfast. Then, (I) went to school. Morning, (I) woke up, ate breakfast, and went to school. (You) don’t do homework and what are you going to do? Drinking party is not today, it’s tomorrow. You can use 「前」 and 「後」 to describe an action as happening before or after another action. Take a bath before going to sleep. (I) properly contacted (you) before (I) came here. Did homework after eating lunch. Swim after eating is dangerous. Note: Be careful of the tense of the verb that comes before 「前」 and 「後」. 「前」 is non-past while 「後」 is always past tense. Another way to describe an action is to use the te-form with 「から」. While similar to 「後」, 「～てから」 conveys a stronger and more immediate relation between the two events, often used for situations where the previous action needs to be completed for the next action to start. (I’ll) do homework after (I) eat dinner. You can express two actions that are taking place simultaneously by attaching 「ながら」 to the end of the stem of the first verb. The tense is determined by the main verb at the end. Do homework while watching TV. (It’s) bad manners to speak while eating. Wrote Japanese text while using dictionary but (it) didn’t get across at all. The conjugation rules for nouns and na-adjectives are identical once again for the past tense. The rule is also the same for i-adjectives and negative forms as they both end in 「い」. As usual, 「いい」 and 「かっこいい」 conjugations start from the original 「よい」 pronunciation. Alice: Spring term will also end soon, huh? John: Finally. Cause it was really tough for various (things). Looking forward to summer vacation! Alice: It was rough sure but it was fun. Lee: And then, we’ll become second-year students, huh? Jonn: That’s right! And then, Tanaka-sensei will become our teacher. Alice: What are you getting happy (about)? Tanaka-sensei’s class is much more difficult, you know. Lee: Tanaka-sensei is cute, huh? The polite form for past nouns and adjectives is similar to the plain past conjugation rules. Note that 「でした」 only applies to nouns and na-adjectives. Japanese learners have a tendency to do the same for i-adjectives, for example 「いいでした」 but it is incorrect! Yamamoto: Tanaka-sensei, how was the trip of Mexico? Tanaka: It was very good. Various (things) were interesting. Yamamoto-sensei also wanted to go, right? Yamamoto: Yes. But because (I have) family, it’s fairly difficult to go to such a far place. Tanaka: I already went so (I) won’t go for a while. Yamamoto: That’s why (for reasons I already said), (I) didn’t have intention of going together with (you) Tanaka-sensei at all. The conjugation rules for the plain past tense are quite simple now that we’ve already learn the rules for the te-form. This is because the plain past tense conjugation rules are almost identical to the rules for the te-form. The only difference is to use 「た」 and 「だ」 in the place of 「て」 and 「で」 respectively. Remember that the progressive tense always end in the ru-verb: 「いる」. This means you can use the same rules as any other ru-verbs to easily change the progressive tense to the past progressive or negative past progressive. Alice: That’s odd. (We) are supposed to study here together but (I) wonder where (he) went? Lee: Alice-chan, sorry. (I) was little late due to an errand. Alice: What were you doing? Lee: A phone call came suddenly from (my) mother. I told John, didn’t (he) tell you? John: Sorry, I didn’t understand the thing (you) were saying so (I) didn’t say anything to Alice-chan. Alice: (You) should properly convey when you didn’t understand something, you know. Lee: Did (you) really understand? The rules for the polite past tense is similar to the other polite tenses and are all based on the verb stem. Yamamoto: Smith-san, good afternoon. It already became thoroughly spring, hasn’t it? Smith: That’s so, isn’t it. Spring vacation really ended quickly. Yamamoto: Is that so? What did (you) do in spring vacation? Smith: (I) rested taking it easy so (I) didn’t do anything in particular. Yamamoto: That is good as well. (It’s) also important to properly take rest so. Smith: Yamamoto-sensei, what did (you) do for vacation? Yamamoto: (I) was doing various things with class preparation. Smith: (It’s) important to properly take rest, you know. The progressive tense in most cases indicate an action that is ongoing. Some simple examples of the progressive tense is “I am watching a movie” or “I am eating”. The same tense is also used to describe an ongoing state resulting from the action such as, “I am married”. In order to learn the conjugation rule for this construction, we must first learn the te-form, a very useful verb form that we will use in many different types of grammar. The conjugation rule for ru-verbs and the exception verbs are fairly easy as you simply need to append 「て」 to the stem. Conjugating a u-verb to the te-form is a bit more complex because we must break up u-verbs into four additional categories. These four categories depend on the last character of the verb. The list below has an example of a common verb with each different ending. The table below illustrated the four different categories and the conjugation rules for each using the list above. In order to change a verb to the progressive tense, we simply need to attach a verb we already learned to the te-form. This is the ru-verb 「いる」 used to express existence of an animate object. In this case, it is used simply as a grammatical construct to express the progressive tense and has little to do with the original verb. To describe a continuing action, first conjugate the verb to the te-form and then attach the ru-verb 「いる」. The beauty and simplicity of this construction is because it ends in the ru-verb 「いる」, any additional conjugations are the same as any other ru-verb, including the polite form. This also applies to the past tense, which we will learn later. Alice: Lee-kun, where are you residing at now? Lee: (I’m) living in the dorm. Alice: Is that so? (I) don’t see (you) much, dorm of where? Lee: The place that’s at the far east direction. Alice: Why are you living in such a far place? Lee: (I’m) a freshman so (we’re) the latest to select a place to live. The 「い」 from 「いる」 can be dropped in more casual situations. Do (you) have (a) pen?